On Monday in Lewisburg Pennsylvania, the Susquehanna Valley Tea Party partnered with FreedomWorks as Ana Puig and Anastasia Przybylski trained over 100 activists on GOTV efforts for local, state and federal elections, the up-coming school choice battle, the strategy of FreedomWorks to elect principled conservatives like Evan Feinberg and for the all-important Senate take over in November of 2012. With the Pennsylvania primary just two weeks away, these GOTV training events are key to winning at every level in this important election year. 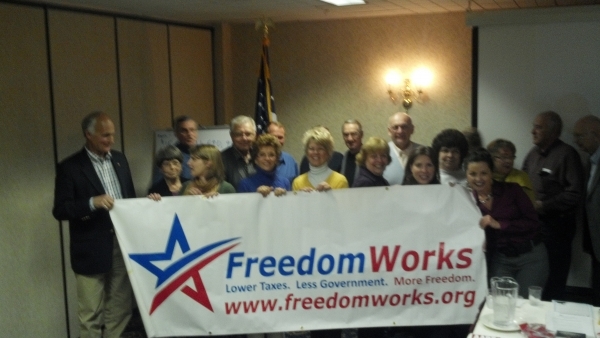 Ana and Anastasia also demonstrated and trained the Susquehanna Valley Tea Party on the FreedomWorks phone-banking strategy. FreedomWorks is dedicated to electing conservatives who vote by their principles, not their party. In order to elect principled conservatives the FreedomWorks Super PAC has endorsed principled conservatives to send to Washington in November. A key strategy in determining victory for these candidates is the phone-Banking efforts by FreedomWorks, which has shown to be an extremely successful tool in winning elections. To view the FreedomWorks endorsements and to take part in phone-banking visit www.FreedomWorksforAmerica.org . Aside from the important issue of electing principled conservatives, Pennsylvania is facing another tough battle, the battle for school choice. As Ana and Anastasia mentioned at Mondays event, FreedomWorks will once again, lead the fight for school choice as the children of Pennsylvania deserve real education reform, not more bloated bureaucracy. Returning the power of decision making from the bureaucrat back to the parent is going to be a hard fought battle that FreedomWorks is committed to winning. As the night came to an end, the Susquehanna Valley Tea Party was fired up and ready to take action to restore conservative values to the state of Pennsylvania. Pennsylvania is in dire need of real conservative leadership and thanks to Tea Partiers like those of the Susquehanna Valley Tea Party, we can look forward to a brighter future for the state of Pennsylvania. Thanks Ana and Anastasia for an informative and inspiring presentation Monday evening.